NHK says nine bodies have been found at a nursing home flooded by heavy rain left by powerful storm in northern Japan. The Japanese national broadcaster said the bodies were found Wednesday morning in Iwaizumi town, where police were investigating the flooding at another facility. The storm made a landfall Tuesday night in the region, triggering mudslides, damaging buildings, roads and bridges, while paralyzing traffic and causing blackouts. At least two rivers swollen by Typhoon Lionrock have broken through embankments, flooding areas in northern Japan. 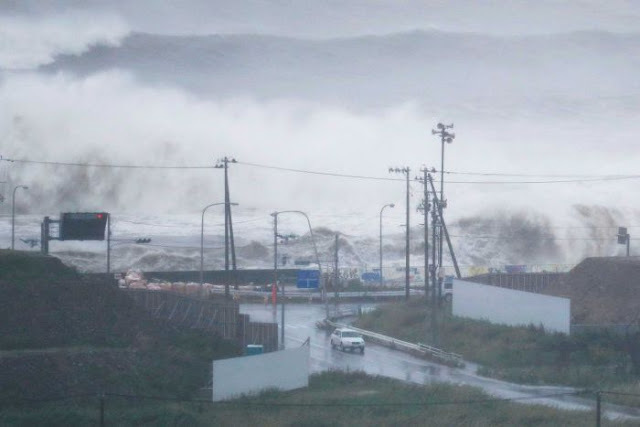 Japanese broadcaster NHK, quoting Japan's Ministry of Land, Infrastructure and Tourism, says the embankments gave way before dawn on Wednesday on the northern island of Hokkaido. It made landfall near the city of Ofunato, 500 kilometers (310 miles) northeast of Tokyo. It's the first time a typhoon has made landfall in the northern region since 1951, when the Japan Meteorological Agency started keeping records. More than 170,000 people were subject to evacuation, including 38,000 in Ofunato, according to the Fire and Disaster Management Agency. More than 10,000 homes in the northern region were without electricity, with power lines damaged from the winds.